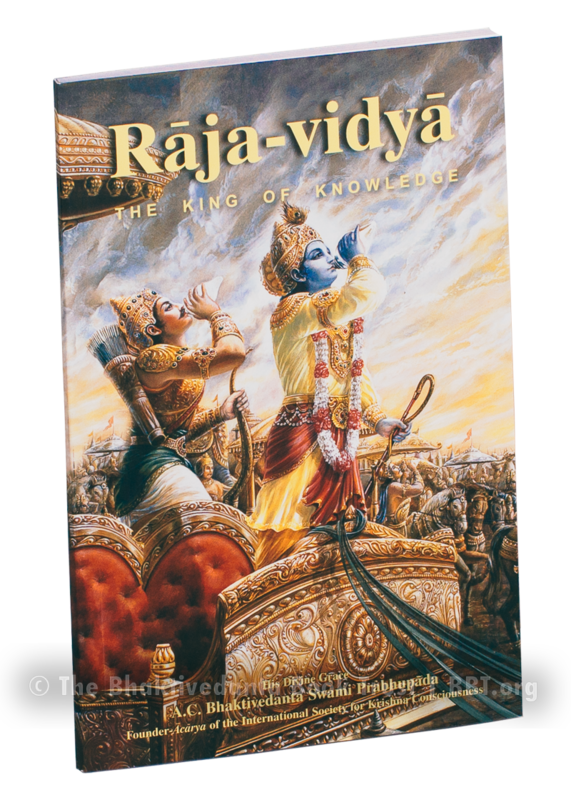 Raja-Vidya: The King of Knowledge is based on the Bhagavad-Gita's pivotal ninth chapter, "The Most Confidential Knowledge." There, Krishna—the Supreme Personality of Godhead—tells His friend Arjuna, "…because you are never envious of Me, I shall impart to you this most conﬁdential knowledge and realization, knowing which you shall be relieved of the miseries of material existence." King of Knowledge began as a series of collected lectures given on the original ninth chapter verses by Srila Prabhupada. He points out that not only Arjuna but anyone can understand the Bhagavad-gita—if we're at least humble enough to accept theoretically that someone else (besides us) is the Supreme Person, and as such might have a thing or two to tell us. Once we understand that everything has its source in the Supreme Person, we know all we need to know. Whereas material knowledge often leads to pride, spiritual knowledge culminates in humility and appreciation for the personal feature of the Absolute Truth, or Krishna, "the all-attractive one." The greater we think we are, the less we'll be attracted to Krishna; and the Bhagavad-gita won't even make sense to us. The King of Knowledge suggests practical ways to enhance our self-knowledge and understanding of the Supreme Person, and thus become free from the anxieties of this temporary, ever-changing world.